We've reached the halfway point of the college basketball season, and conference play is beginning to heat up. 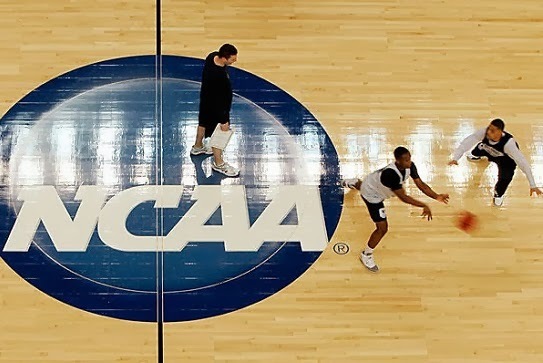 Let's take a look at some of the big trends and major storylines on the road to March Madness. - The kids are good, but not great yet. One of the biggest stories entering the college basketball season was the arrival of the "Class of 2013," which some people believe is the best freshman class in a decade. The results have been mixed for some of the biggest names; Jabari Parker, Julius Randle, Andrew Wiggins, Aaron Gordon and Tyler Ennis. The biggest issue for these star freshmen is when to take over on the offensive end and consistent focus on the defensive side of the ball. Each of them have had some outstanding moments throughout the first couple months of the season, but they've each had play that reminds you that they are just 18 and 19-year-olds as well. - Syracuse could 2-3 their way to the title. The Orange's relentless 2-3 zone defense is back again, and it's suffocating opponents on a gamely basis. So far this season, only two teams have been able to reach the 70-point mark against Syracuse, and over the last six games, teams are averaging a measly 50.8 points per. In their first year in the ACC, it's Syracuse's to lose right now, especially with teams like Duke and North Carolina struggling. The Orange's offense hasn't always been pretty, but they are beginning to find themselves after losing three of their four top scorers from a season ago. Led by C.J. Fair, Trevor Cooney, and the aforementioned freshman Tyler Ennis, who has a nice 4-to-1 assist to turnover ratio, the 'Cuse could be making a return trip to the Final Four. - Wichita State is legit. There is a tendency in some college basketball circles to dismiss a team as a non-contender if they're outside a conventional "power conference." Despite coming off of a Final Four appearance a year ago, Wichita State to this point in the season has largely been ignored, but they have played their way back on the scene as one of the top teams in the country. One of the great things about the Shockers is their ability to play virtually any style in a particular game. Defense and rebounding will be the calling card for this experienced group if they are to be a factor throughout the NCAA Tournament. - The SEC is struggling. Once January hits and the basketball season heats up, you don't hear many "SEC, SEC, SEC!" chants across the south, because Southeastern Conference fans with sense know that basketball has been on the decline over the last few years. Florida is a solid top 10 team with wins over Memphis and Kansas, so they should be a tough out come March. Despite some uneven performances early in the season, Kentucky could be a force with another set of freshmen talent, led by Julius Randle. After those two clubs, you could make an argument that the SEC will have a hard time getting a third or fourth team in the tournament. Perhaps the most alarming number that is currently attached to the conference is 74, as ten SEC squads have an RPI of that number or worse. Normally an at-large team that gets in the tourney won't have a number much worse than 50. - Parity is reigning again. Ten different conferences are currently being represented out of the top 35 teams in the country according to the AP Poll. One of the biggest selling points for college basketball fans is that any team can get hot in March and make a run that can put their school on the map. A year ago, no one knew who Florida Gulf Coast was, but they burst on the scene with a pair of tournament wins and became a household name. Based on what we've seen the last two years during the first weekend of the tourney, double-digit seeds could again wreak havoc on brackets everywhere. Who do you like to win it all? Seems really wide open this season.